The housing sales slump continues in California. Contrasted with the phenomenal growth the last few years, and this does feel like a major correction or bubble bursting. In fact, home sales in San Francisco alone in January fell a jaw dropping 39% and prices plummeted 11.3%. Average home price in SF is now $1,330,000. Is this an ideal time to sell? Shockingly, San Francisco’s mayor has a huge surplus from property taxes collected, a sum she intends to keep on collecting despite a resale homes market sagging badly and that it keeps houses and apartments out of reach for working class residents. Although he plans to use some of it to support homelessness in San Francisco, there is little support for building new homes and apartments. San Francisco homeowners saw their equity drop by $170,000 just in the last month alone and prices may see a further fall in March. Is this a market crash, or just a lull in demand. With the economy set to resume, mortgage rates staying low, San Francisco’s mayor would be wise to get back to the supply side to serve this growing demand. While everyone’s wondering if the Bay Area’s housing market is about to slide into 2019, some are saying all is well. Zillow gives the market a rating of 10 out of 10 for market health. Supporting San Francisco home prices is the fantastic climate, diversity of activities, and the success of Silicon Valley in the Free Trade era. However, that era is ending and giving concern to whether the Los Angeles, San Jose, and Bay Area’s economic picture will deteriorate in 2019. Given the resistance to housing development in the area, we can be certain prices will stay high even as confidence in California’s housing market and economy slides a little. According to Realtor.com, the average home price in San Francisco is $1,388,000. 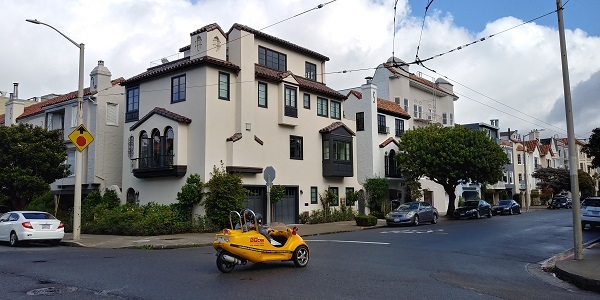 Zillow is forecasting a further increase in the average home price in 2019 of 1.45 million in San Franciso. That’s a rise of 7.4%. DOM in San Francisco County is down to 39 days. The strength of demand is making many sellers hang on, or decide to sell their home or condo. This chart showing listing prices over the last 10 years reveals a steep steady climb out of the recession to 100% more than in 2011. Since President Trump’s election, asking prices have risen $130,000 higher. 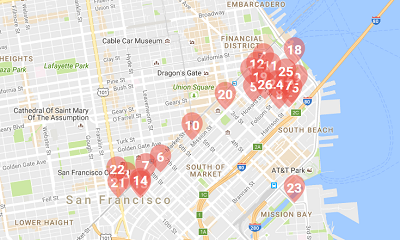 This chart from Rentcafe, shows the lofty rent prices in San Francisco for each sized home. For the much desired 2 bedroom, an average rental price of 4,377 a month makes this city one of the least affordable for renters. Rents have risen $200 a month since 2015. Enjoy this look at the housing market and real estate opportunity in the San Francisco Bay Area market. There are plenty of stats and charts below to help you understand the market better. How big is the need for new affordable housing in the Bay Area? It’s a textbook case of supply and demand where demand is huge and development is stunted and where current homeowners have no intention of moving, even after retirement. This recent news about a Palo Alto commissioner quitting her job below, because it’s too expensive in Palo Alto, says it all for everyone in the Bay Area and City of San Francisco. This woman and her family are moving 40 miles away to Vera Cruz. “We rent our current home with another couple for $6,200 a month,” she wrote. “If we wanted to buy the same home and share it with children and not roommates, it would cost $2.7 million and our monthly payment would be $12,177 a month in mortgage, taxes, and insurance. That’s $146,127 per year — an entire professional’s income before taxes.” – experpt from a news report in Bizjournal. Looking for a better quote on San Francisco Auto Insurance. Find out how you can save on auto insurance and save thousands of dollars on your next policy. Time to switch insurance companies to get the rate you deserve. San Francisco home prices are $1 million above the above the average detached home price of a home sold across the US. The forecast for San Francisco is an extreme version of the Los Angeles forecast. The Trump government is shining the light on local governments and associations who may be deliberately thwarting housing development. This might be the biggest news in real estate in 2019 to 2020. Is exposure of municipal and state government restrictions and management of land and development going to a major break for new home investors and builders? Should the 2019 forecast be about a renewed building boom or about resignation to NIMBY resistance? The Legislative Analyst’s Office found that California’s coastal metros take about two and a half months longer, on average, to issue a building permit than in a typical California inland community or the typical U.S. metro,” the report admits. The result is housing gridlock. From a post in sfchronicle.com. 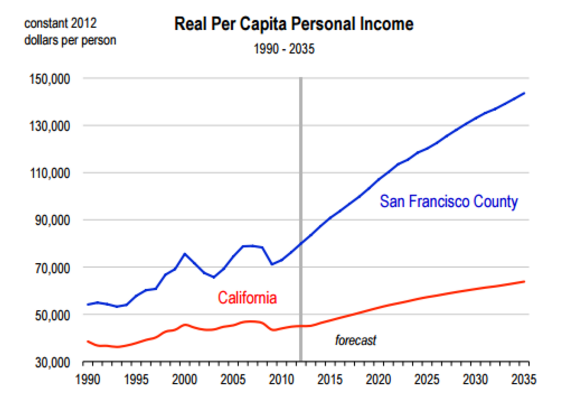 Will the Hot Economy in the Bay area Continue? Reports on San Francisco’s jobs and income growth look excellent. And if you’re a Trump believer, and supporter of bringing back American jobs, you have to feel pretty good about the jobs outlook, unless you’re a renter. The San Francisco Metropolitan District (MD) continues to lead the state in job growth, and with an annual 4% increase in employment as of March 2016, is expanding its workforce at one and a half times the pace of California as a whole (2.65%). The San Francisco MD added 41,900 new nonfarm positions to its jobs base from March 2015 to March 2016. — from Beacon Economics report on the San Francisco economy. 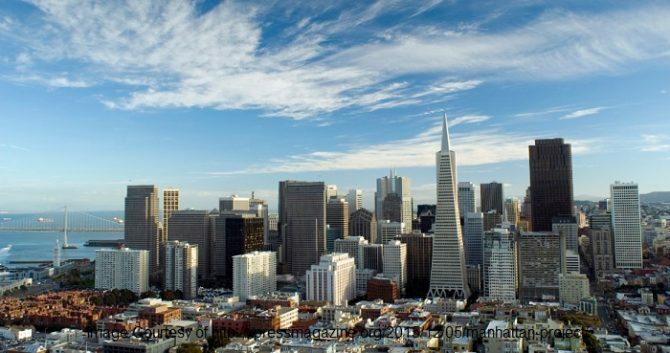 The Bay Area and California are in for slower job growth this year and next, but the Bay Area, powered by its high-tech economic engine, will outpace the state in job creation, according to two new economic forecasts released Wednesday. Why? The housing affordability rate has dropped 21% in 6 years. Key drivers of unaffordability are immigration, high tech business success, and development bottlenecks. In San Francisco, people have to pay whatever the market demands. And renters haven’t been looking really to buy. Only 16% bother to contact a realtor. Homes in the San Francisco Bay Area, lead in selling above asking in 2016 (67%). And just south in San Jose, homes sold for a whopping 68% above their purchase prices. These areas are rated as the top cities in the US to invest in real estate. San Jose and San Francisco led California in home price gains, followed by Sacramento and Los Angeles. San Diego’s not far behind. Now in 2017, we’ve seen prices fall in most areas of the SF Bay, except San Francisco and Santa Clara. I’m getting calls from Realtors north of SF so it looks like those areas are becoming more affordable options compared to SF which just keeps heating up. And with home prices staying or rising, the forecast for apartment rentals is high demand and high prices — great news for rental income property investors. Accommodation costs are a significant personal and professional problem for Californians which may never go away. Looks like developers are gearing up for even greater supply. Overall, the US homes forecast and the Los Angeles housing predictions and outlook are positive. The introduction of Donald Trump and republican government policies to loosen up restrictions on mortgages and perhaps development land could ease prices, but it may take quite a while. If the economy improves, there could be an additional rush of new workers to the area. Employment outlook: SF now has 547,000 employed people compared to 448,000 during the dot com boom era an increase of 99,000. Lots of high earning renters and buyers. Need a home loan? Use the mortgage calculator to find out how much you should borrow. This recently published chart from Zillow reveals the California cities of San Diego, Los Angeles, San Jose, Sacramento, and San Francisco are the most expensive and least affordable places to buy a home. Combine the stressful commute times in LA, and the Bay Area, and you have a population feeling on edge, uncertain of their long term future. The word rent is one of the foremost ones in the vocabulary of Californians. Only 30% own their own home. Fueling the frenzied demand for San Francisco apartment rentals is a growing affluent and young population whose incomes are rising. San Francisco has the highest apartment rentals prices in the US. The national Apartment rental index chart from Apartment list shows how prices have jumped this year across the country. 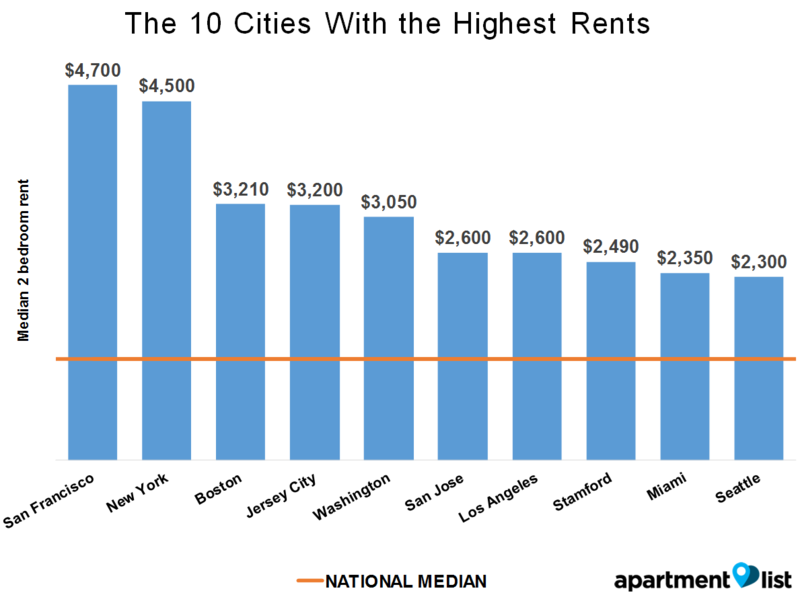 And the rental apartment rates in San Francisco, San Jose and Los Angeles are in the top ten most expensive. An average apartment for rent in San Francisco will set you back a whopping $4700 per month. The C.A.R. forecast sees a modest increase in existing home sales of 1.4 % next year to reach 413,000 units, up slightly from the projected 2016 sales figure of 407,300 homes sold. Sales in 2016 also will be virtually flat at 407,300 existing, single-family home sales, compared with the 408,800 pace of homes sold in 2015. “Next year, California’s housing market will be driven by tight housing supplies and the lowest housing affordability in six years,” said C.A.R. President Pat “Ziggy” Zicarelli. “The market will experience regional differences, with more affordable areas, such as the Inland Empire and Central Valley, outperforming the urban coastal centers, where high home prices and a limited availability of homes on the market will hamper sales. Renters used to stay in town, but they are forced ever more into the surrounding countryside along with those who can buy, to search for cheaper places. The commute times for renters and buyers will get much longer and automobile insurance, maintenance and fuel costs will add to their cost of living. Despite a rise in condo developments, buyers are looking far outside San Francisco for a new home. Where to buy Homes in San Francisco? Wondering what is being developed in San Francisco? SF Curbed has a listing of 26 proposed high rise developments in the works. Check them out in the link at right. The Rincon Hill development is the first neighborhood plan adopted by the SF Planning Commission in more than 10 years. Combined with the Transbay area development, it is a major housing development estimated to create housing for as many as 20,000 new residents. High rise towers in San Francisco? Yes, the Rincon development is for construction of 4 to 8 story buildings, and slender residential towers ranging in heights of 250 to 550 feet. The tallest towers are slated for the top of Rincon Hill, where they will form a distinctive new element on the City’s skyline. You’ve read the stats – record high and continuing job growth, huge multinational high tech firms with boatloads of cash, a changing mood toward land and housing development, and a new US president who may be biased toward real estate development. The investment opportunity in SF looks to be as strong as it is anywhere, with the potential of extreme profits on investment. Home flippers, new construction developers, and small builders should find plenty of room for profit if they can get property owners to sell their land. Is this the right year to buy rental income property? Find out more about the best investments in 2019 including investing in real estate. Gord Collins generates leads for realtors in Los Angeles, Anaheim, Beverly Hills, Malibu, San Diego, San Francisco, San Jose, Fresno, Santa Clara, Sacramento, Mountainview, Palo Alto, Sunnyvale, Riverside, Rancho Cucamonga, Costa Mesa, Thousand Oaks, Simi Valley, Oceanside, Long Beach, Huntington Beach, Carlsbad, Santa Clarita, Temecula, Stockton, Palm Springs, Chula Vista, Escondido, Santa Monica, and more.